I've had my y510p for about 3 months now (after it was replace because the first one I recieved went all crashy and insane). I "upgraded" windows 8 to windows 8.1 in a funny moment about a week after I got it - which over all seems to have gone totally fine. The elan touchpad has always been a little anoyingly "wooly" but basically functioned well. But about 3 weeks ago it started making little hops as I tapped meaning I clicked on the wrong thing and then it started sometimes wandering and jittering while my fingers were resting on it (especially anoying when using 2 finger scrolling). then it started going into a little dancing about mode where occassionally it starts hopping about and clicking on things. which is a total pain. Its anoying enough now that I dont trust it and as often as possible turn it off and use an external mouse - but obviously that not good enough. Any help gratefully recieved - I really hope its a fixable software problem as I'm in the middle of a big project and cant afford to have my laptop out of action any time soon. Unfortunately the drivers on the Lenovo website are quite old. I got fed up with how the track pad works in the Y510P so I started experimenting with a variety of drivers. The ELAN drivers I am using now are intended for Toshiba laptops but they work fine on the Y510P. You can read more info starting here. I find that the track pad is a lot better with these drivers. There are more adjustments and more features so you can get it working like how a track pad is supposed to work. Lenovo has ignored this problem for months. You will need to fix this problem yourself. I plan to write a clear guide this weekend with lots of pictures to show you exactly what needs to be done to install these drivers into a Lenovo Y510P. thnks for the reply. I'll try the driver from the link on your other post. Did you ever make the step by step - that would be helpful. But - just to check before I go through all the rigmarole of this update - do you think these drivers will help the stability of my device or do they just have more features - do you think there is any reason to suppose they will help with my randomised jumping and clicking problem? Is that likely to be a hardwear problem? 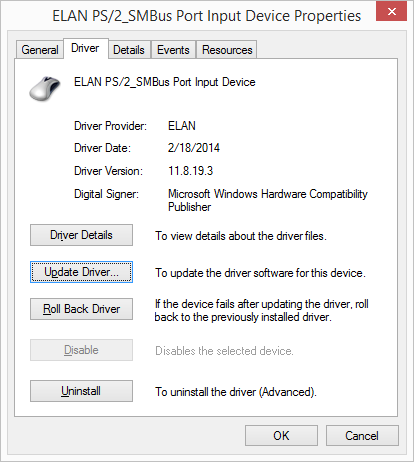 These drivers made a BIG difference to the stability of the ELAN track pad.in my Y510P. The twitch is gone. Unfortunately I have had zero feedback so I have not written up a guide. Installing some free drivers is hardly a rigamarole. For a few minutes of your time, your ELAN track pad will start working a lot better. If you take a few more minutes to set up a dead area over top of where the mouse buttons are, this will fix another big problem with the Y510P. You will finally be able to use the mouse buttons without the mouse jumping to a different location. You have nothing to lose and everything to gain. I was considering selling my Y510P before finding these drivers but not now. Here's a few more clues about installing these drivers. Download the drivers, unzip them and when updating your drivers, tell the installer that you have a disk and Browse to the X64 directory that contains the ETD.inf install information file that you just downloaded. Installling these drivers is not rocket science. I will do up a guide by next weekend. let you know what the results are. Thanks for posting this info -- even though it seems fairly simple to do, I am extremely hesitant to do anything further to my 510p. I got it in March, allowed Windows to update itself two days later, and had the black screen-and-nothing-else for a week. Reading other first buyers' experiences was disappointing. I reinstalled with OKR, it's been working fine, except for the Elan touchpad since then, not allowing windows or anything to update at all. I've adapted to the lack of two finger activity by pressing down on and clicking the entire touchpad with two fingers for right button touch. But no three or four fingers action is possible. The drifting, self-clicking cursor has not started for me yet. I would welcome detailed instructions on this, admittedly, simple driver update. I haven't touched one outside driver thus far, based on my first week of black screen. I hope you'll post this guide, I will try it. Thanks! Theres nothing I can do until after the 17th as I have a big project on which relies on me having my machine in action (such as it is) - does anyone have any experience of the customer service with getting things fixed? (que fresh outrage when I realise that the Think section of Lenovo is serviced differently from the rest - it feels like they are resting on the bought in reputation???) ah but perhaps this is straying into bitter ranting so I'll get off now - just wish I have know it was going to be this complicated and saddening. *- why cant we just have buttons? I like buttons -you know where you are with a button! I tried installing these drivers a 101 different ways and found out that you need to follow a complicated procedure to get them to install correctly. Try following this guide and see if it fixes your problems. It is possible that your track pad has something physically wrong with it but try installing these drivers one more time just to see if it makes a difference. thanks for the good drivers but even with asus or toshiba drivers the touch pad still has a mind of its own. if you squeeze on both sides of the touch pad (the palm rest imidiateltely on the edge of both sides of the touch pad) the misbehaviour stops so i kno it is some form of a grounding/ static build up problem.